Compass Group is a British multinational contract foodservice company serving around 5.5 billion meals in 50 countries. • “We need a new menu management system. But wait – didn’t we just get rid of one last month? • What problem are we trying to fix? • Which processes are associated? • Which users groups are affected? Conflicting priorities and a lack of visibility of the current landscape across the various viewpoints required to drive rationale decision-making created a request backlog and many frustrations. 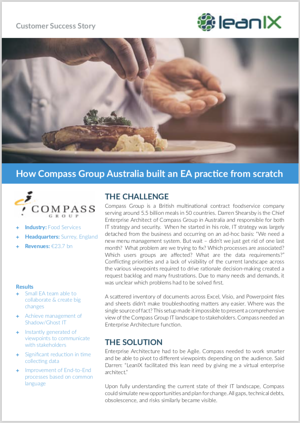 Small EA team able to collaborate & create big changes Achieve management of Shadow/Ghost IT Instantly generated of viewpoints to communicate with stakeholders Significant reduction in time collecting data Improvement of End-to-End processes based on common language Download the Success Story now!